With the completion of the international break, Europe’s major leagues are approaching those crucial final games of the season. In Spain Real Madrid have a two point lead and a game in hand over rivals Barcelona, with both teams about to face three La Liga games in six days. Barcelona host a faltering Sevilla at the Camp Nou, sandwiched between away trips against Granada and Malaga, whilst Real entertain Alaves, then travel to Leganes, before a daunting home game against city rivals Atletico on the 8th April. 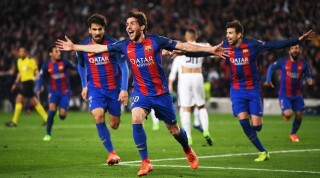 After their demolition of Paris Saint Germain in the Champions League, would anyone dare write off Barcelona’s chances of coming from behind to overtake Real Madrid, even if the final El Clásico game in the third week of April takes place at the Estadio Santiago Bernabeu? In the end it’s likely that La Liga will be decided on which team picks up most points in games in which they struggle. Whilst both teams have had their share of comfortable wins, at times both have had to dig deep to score important late goals to change the outcome of matches. Barcelona have picked up an additional eight points, thanks largely to the magic of Lionel Messi. His late goals against Valencia, Villarreal, Leganes and Atletico Madrid, plus Luis Suarez’s late goal against Real Betis providing these points. Real Madrid have had a number of games in which late goals have changed the outcome of their games. 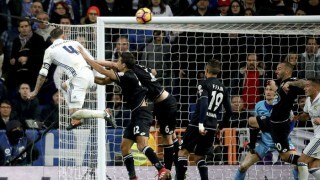 Against both Deportivo La Coruna and Villarreal, Real recovered from losing positions to collect maximum points, whilst a late goal against Real Betis saw them convert one point into three. Ronaldo’s last minute goal against Las Palmas at the start of March rescued a point for his team and crucially Sergio Ramos’s 90th minute goal at the Camp Nou not only rescued a point for Real Madrid, it also meant that Barcelona dropped two points from a winning position. Whilst Barça have Messi’s goals to thank for their extra points, it is Real Madrid’s ability in the air that has been largely responsible for these extra points which could be crucial in the deciding the outcome of the league title. Love him or hate him, Sergio Ramos has delivered at the crucial times, with six of his seven goals this season coming from headers, with three scored at the death against Barcelona, Deportivo La Coruna and Real Betis respectively. But it hasn’t all been about Ramos, with Mariano Diaz, Bale, Ronaldo and Morata all scoring vital late headed goals. With Ronaldo out of sorts at times this season and Bale out injured for a number of months, Real have at times struggled to score goals, so their aerial prowess has been one of the keys factors in breaking down stubborn opposition defences. Of their 71 league goals, 29.6% have been scored from headers, a percentage bettered only by Real Sociedad (33%), Deportivo La Coruna (32%) and Malaga (30%); however their 21 headed goals is considerably more than the 14 scored by Sociedad and the 10 scored by Deportivo, Malaga and Espanyol. Real’s headed goals have come from eight different players, with Sergio Ramos’s six the most headed goals in La Liga and one better than Cristiano Ronaldo, whilst Bale and Morata have each contributed with three headed goals. Twelve of the headed goals have come from open play situations, whilst nine have followed set plays. Whilst Real have scored almost an equal number of goals at home and away, they have scored twice as many headed goals (14) at home than on their travels (7). There may well be more twists and turns in the title race in Spain, but it could well be that Real’s ability to use their heads effectively, could be the difference between finishing up as champions or as runners-up.